A residential client was recently very pleased to receive planning permission for a new storage barn from Aylesbury Vale District Council. Our client was seeking to demolish an existing old and dilapidated storage barn at the front of their property, close to the roadside, and replace it with a very similar structure to be used as a workshop and also for storage. Their property is a Grade II listed cottage which is also within a Conservation Area, and so a compelling case had to be made to the local planning authority to demolish what was already there. Our case was aided by the design of the replacement building, which has an enlarged footprint, but also took great care to replicate the style and appearance of the existing ‘rustic’ structure. Our design met the requirements of the Council’s heritage officer, and planning permission together with Listed Building Consent was granted. Our client is now intending to start works on the new building this Spring. This entry was posted in Barn, Barn conversion, conservation area, construction, design, Listed building consent, planning permission, Residential on January 18, 2017 by admin. We were delighted last week to hear that planning permission has been granted by Bedford Borough Council for a new two classroom modular unit to be located within the grounds of Shortstown Primary School. This School serves a community just to the south east of Bedford. A growth in pupil numbers has resulted in a shortfall of teaching space, and so the modular unit will be used to boost the number of classrooms available. Our bespoke design created a simple form and layout for the unit, which has a footprint of just under 200m2. There are centrally located facilities, including a separate room for smaller teaching groups or meetings and WCs. The appearance will be enhanced with horizontal natural cedar cladding. School staff are really pleased with the positive planning outcome, and are presently engaged in finding a contractor to construct and install the bespoke unit which will be ready for occupation this Spring. This entry was posted in Bedfordshire, classroom, construction, modular unit, planning permission, School Construction, school extension on January 9, 2017 by admin. A residential client recently sought help with construction of a new barn at their home in the heart of the Chilterns. 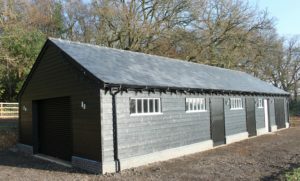 There were already a couple of old timber shed structures in the paddock, but the aspiration was for a new attractive building that could not only act as a stable but also provide storage for garden machinery. 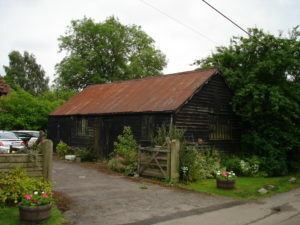 Because the property is within the Chilterns Area of Outstanding Natural Beauty planning consent was required. We were pleased to secure planning permission for the barn design, and we then went on to project manage the build for our client. The building is future-proof, meaning that methods of construction could allow the structure to be put to alternative uses if so desired in the future. This entry was posted in Area of Outstanding Natural Beauty, Barn, Barn conversion, Buckinghamshire, planning consent, planning permission, Residential on January 4, 2017 by admin.